SEMIK: Way past due for archiving this! Hey, I've been a little busy.... :-). Glad to see that this event was well received. We are excited to do it again for 2012!! It has been a few years since we had the cache awards so Flipper & Co, Skippy. and I will be hosting the Cache awards 2PM 18 March 2012 at Orphanage Park (behind Tabor Adelaide) on Goodwood Road in Millswood. The park has a Playground, BBQ, toilets and plenty of parking. 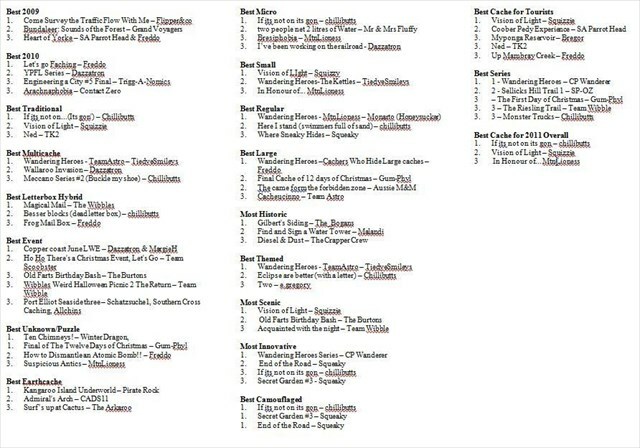 Prizes will be awarded based on the categories -- we're pretty sure you're going to like them! 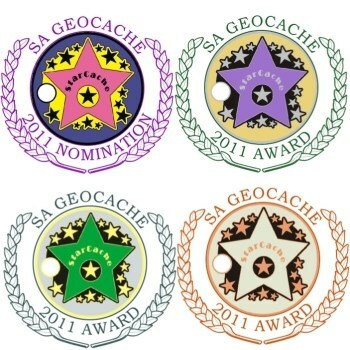 The caches have to be placed in South Australia between 1st of January 2011 & 31 December 2011. The placed date and location will be officially determined by the GC.com cache page. Please send nominations in these stated categories to SACacheAwards@gmail.com Please include both the name of the cache and its GC number (sometimes caches are named similar). GC.com Favourite points Highly Recommended to help your favourite caches in the nominations and voting process. Nominations from interstate cachers welcomed! Only the eligible caches are limited to being placed in SA. Time To Vote!! You have until 10 March 2012 to submit your votes. We must have 7 days to tally the votes and prepare for the awards ceremony so no late submissions will be accepted. Please go here to cast your votes -- further instructions are there.